Do you struggle with the removal of persistent smears, water streaks and dust build-ups from your windows? Do they cost you too much energy and you don't want to engage in this chore? This process will no longer consume a lot of your time and energy! The specialists of window cleaning in Fleet Street are going to give you a hand! You will be able to use your spare time as you wish – the fully instructed and reliable team members will manage the washing and cleaning. We provide impeccable cleaning services for all kinds of glass surfaces. Read further and discover more about the different perks you can get. We also provide our professional services in nearby areas: Tower Hill, Ludgate Hill, Fenchurch Street, Blackfriars, Tower of London. 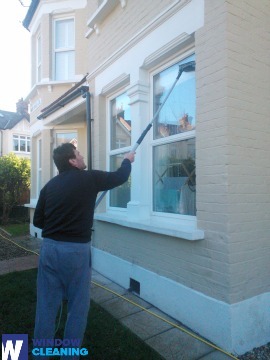 You can rely on the abilities and experience of the experts for cleaning all kinds of windows. The glass surfaces in our competence are: small or double windows, sash ones and bay windows. Of course, if you have garden windows, French doors, conservatory or skylights, we will make them nicely-looking, too. With our progressive methods and latest equipment, we can cope with all types of window cleaning, even with difficult to reach glass panes. With our abilities and workmanship, the good look of your property will be achieved immediately – the adepts of commercial window cleaning will deal with this matter. We utilise water-fed extension pole system for speedy and effective window cleaning, up to the fourth floor. For office buildings taller than the forth floor, we use modern rope access techniques. With these appliances, we can reach the highest glass panes, even on the skyscraper-sized buildings London is so famous about. From small shops to towering business edifices, we assure you top-notch services – book, now! We provide residential and business window cleaning by using advanced techniques. You can rely on our skills for all types of glass surfaces, skylights and conservatories. For windows placed as high as the fourth floor, we use water-fed extension poles. This system is handy and allows risk-free cleaning systems – the poles are attached to the water supply in the van. For high-rise windows, our rope access solution will grant you quick and great end results. You can gain a lot from these services right now – just call 020 3746 3113 and place an order! Profit from our domestic window cleaning in Fleet Street – we provide five-star services for your home on attractive prices. We use purified water to clean the windows inside and out. We stay safely on the ground and clean with water-fed pole system. Talk to us now - call 020 3746 3113 or just fill in our booking form. Our operators will help you book and answer any questions. You will love the end-results of our domestic services, we guarantee that!